In recognition of all the incredible hard work that all the children and staff have done since we introduced Read Write Inc. in September 2012, the school has been awarded the Read Write Inc. Accreditation Award. 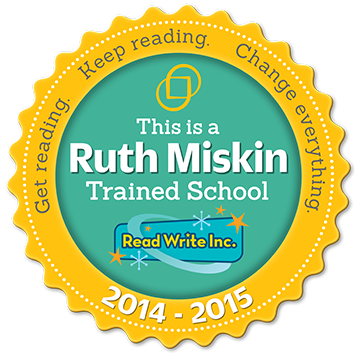 This award recognises that as a school we are committed to ensuring every child can read, that every member of staff receives high quality training to deliver the Read Write Inc. program and that we are regularly monitored by Ruth Miskin Training to ensure that we deliver the program effectively. This award recognises that the school is doing everything to make sure that every child can read and write effectively. If you require any more information about the Read Write Inc. program, please don't hesitate to contact Mr Hodges, Read Write Inc. Manager, at school.